On the Boys side we will see seven State Qualifiers Return with four State Medalists among them.I think the 1600m is primed to be a FAST race this year, and I think there will be a couple of runners faster than last years winning time of 4:20. 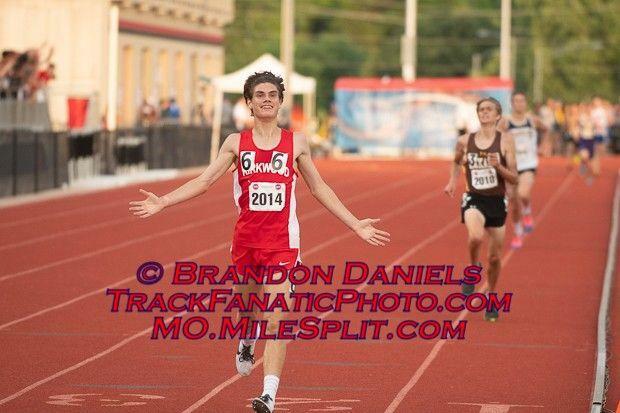 The top returner and presumptive favorite is Christian Baker of Kirkwood. He placed 4th at State last year with a PR of 4:24 after winning the 3200m the day prior, and recently just won the State XC Championship. Wesley Porter of Rockhurst who was narrowly defeated by a tenth of a second by Baker last year at State will likely be right there with him again this year. Porter came back from an injury during XC and still managed to place 5th. A healthy Wes Porter on the track could be very dangerous. I wouldn't be the least bit shocked if this comes down to the final 40m or so. Tom Seitzer, Zach Reed and Robert Gibson are the next three on the list, all running 4:25 last year and I think they all potentially could be part of that sub 4:20 group as well, and if we learned anything from last year we know that anything can happen in these close distance races at State. Below you can find my subjective rankings and honorable mentions.